If you were wondering whether there are any Craps strategies, you’ve come to the right place. I am about to introduce you to the Hammerlock Craps System. We will go through the rules and the purpose this strategy is claimed to have. This is a shout-out to all the players who always want to know more. Before moving on to this particular betting system, it is essential to review the basics of the game. 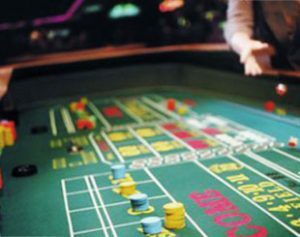 Craps tables are available at every land-based casino, although the rules may vary from one house to another. Online gambling world is also full of websites that offer this table game. All in all, in case you feel like rolling the dice for real money, you will not encounter any difficulties finding a place to do it. Difficulties arise when it comes to calculating the odds in order to make the most out of the game. Even though craps seem like a simple game of chance, it is not just about rolling the dice without giving it a second thought. However, do not let the game’s branched out concept concern you. Dedicate some time and effort to it, and you will be fine. Nevertheless, do not take any strategy for granted. Their purpose is to give you more options regarding the moves you make during a game, but do not consider them a warranty. Did you know that the venue affected the name of the game? It is either called street craps or bank craps, depending on whether you play it at home or in a casino. The location also has an impact on some rules. In the game of street craps, the players bet against each other, whereas in bank craps, the casino has the role of a bank — which is where the name originated from. The shooter kickstarts the game by placing their bet. The other players can wager afterwards. They place their bets on the pass line, or the don’t pass bar, depending on whether they choose to bet on the shooter’s side or against them. Other areas on the table include the come and don’t come sections. They are similar to the previous ones, but you cannot bet on them on the first roll. The central section of the table is for the proposition bets and hard-way bets. The latter implies betting that the hard 8 (two fours) will appear before an easy one. The area marked “field” is where you place your bet if you expect to see the following numbers next: 2, 3, 4, 10, 11, and 12. The sections that have written 4, 5, six, 8, nine, and 10 on them are for buy bets. Basically, placing such bets is betting that the written numbers will come up before a 7. Lastly, big 6 and big 8 spaces are for betting any of the two numbers will appear before a 7. After the bets have been placed, it is time for the shooter’s come-out roll. If you have bet before this one, pay attention. Landing a 7 or an 11 is called a natural winner, and it brings money to those of you who have bet on the pass line. The don’t pass bar bettors win in case the come-out roll results in a 2, 3, 12 or craps, according to the slang of the game. However, this roll could end up landing some other number. If that happens to be the case, the shooter has established a point. The following roll directly affects the course of the game. There are two outcomes that matter — hitting the point or rolling a 7. In the case of the first scenario, everyone passes, and the new come-out roll is upon you. However, the second scenario voids all the bets, and the shooter passes the dice to the next player. In case you are among the players whose bets are on the don’t pass line when the shooter establishes their point, you have an extra option. I am talking about the odds bet, which can be placed right behind the don’t pass line. Provided that the shooter manages to hit their point, you win both of your bets. Now that we had our tour around the craps table, we can move on to the main subject — the hammerlock. You might want to hear the story about the origins of this betting system, and the reason it has such a menacing name. A few decades ago, during the 1990s, there was a man who walked in one of the casinos in downtown Las Vegas and approached a craps table. The casino was referred to as the Binion’s, and it was famous for its vast number of craps tables. It was some kind of a craps joint as it offered high limits. The man disregarded the differences between the hot and cold rolls. He was different from other high rollers who had a habit of placing their bets all around the table. The mysterious man ignored it all, and he bet only on certain sections. It seemed that he could not lose, — like he had put the casino in a Hammerlock. By the end of the day, everyone started calling him Hammerlock. The man continued playing and winning, all the while causing turmoil to the casino. As a matter of fact, the owner felt like Hammerlock was taking what rightfully belonged to him. However, Hammerlock kept piling up his winnings until he abruptly disappeared with over one million dollars fairly won. He appeared several times afterwards at various places across Atlantic City and Las Vegas, always applying the same strategy and cashing out huge amounts of money. The secret of his system, however, did not disappear along with him. A certain craps expert of the time has written it down and saved it, so I am about to present it to you. This betting system claims that a player can make a profit regardless of what number turns up. According to it, you do not have to be afraid of being sevened out. Basically, the Hammerlock claims that a casino does not stand a chance against you. The Hammerlock implies combining two to four place bets and the odds bet. By placing these wagers, the player is betting against the shooter. The place bets form the upper portion of the Hammerlock Craps. The odds bet has a supporting role, and it is placed below the place bets in the don’t pass area. Overall, setting up the Hammerlock Craps implies placing up to eight bets. The upper section and the supporting one can both be used as two separate strategies, but that is a whole different story. In order to set up the upper section of the Hammerlock Craps, you need to place your bets on numbers five, six, eight, and nine. Those on five and nine are in multiples of 5, whereas the ones on six and eight are in multiples of 6. There are five levels of place bets. The first one implies betting $12 on 6 and 8. The following ones include all the numbers, and the amounts are $22, $44, $66, and $88 respectively. The right moment for place bets is after the shooter has established their point. On the first level, you take your place bets down when you win one of them. On the other levels, you take down the one you have won and leave the rest for one more roll. After you have won again, take all of them down. In case you happen to seven out, take the place bets to the next level after the shooter has established a new point. However, if the round goes successfully, wait for the next point and place your bets on the level right below the one you have played on. Craps are famous for being a game with a rather high house edge. That is, if you do not place the odds bet. However, if you do, you reduce the advantage the house normally has. The area for this bet is not marked on the table, in spite of its importance. You place it just below the pass bar or don’t pass bar, depending on whether you have made a pass line bet or a don’t pass line one. The first case scenario makes placing this bet taking odds, while the second one makes it laying odds. Make sure the amount of the odds bet does not surpass the amount of your pass or don’t pass bar bet. Taking odds means you are betting that the shooter will hit their point. Placing this bet is rather popular because you can receive a payout larger than your bet, provided you win. Laying odds implies betting against the shooter. You are more likely to win this way, which is why the ratio between the bet and a payout is different from the one described above. Laying odds dictates betting more money than you may receive in case you win. According to one research that has been conducted recently, the chances of winning when playing Hammerlock Craps are rather big. As the story goes, a group comprising of 34 players was a sample. The group included both experienced gamblers and beginners. They have participated in over five thousand craps games and kept a record of them in order to provide accurate results. The established target win was $60, and the games in which that goal was achieved or surpassed were being stopped. The same goes for losing the bankroll, as well as for the games that went on for too long. According to the experiment, the winning percentage was over 92%. That makes almost $40 per single game. Given the results, the Hammerlock strategy appears to be the safest way of playing this game. When you deduct the losses, you are left with a rather generous amount of money to show for, provided you follow in the footsteps of Hammerlock the way the sample players did. The betting system I have presented to you in the previous lines is rather elaborate. It takes time and practice, not because it is difficult to comprehend, but simply because you need to keep track of a lot of things. If you dive into it without any preparation, you could get confused easily. This is probably not what you want to happen when you count on the dice to bring you money. The Hammerlock betting system comprises placing two types of bets in certain places and taking care of the course of the game in order to know when it is the moment for betting. Not only do you have to manage the bets in accordance with space and time, but you also have to remember to raise them to the upper level. Additionally, you can take them to the lower one, depending on the outcome of the previous round. As you can see, playing the Hammerlock Craps implies handling things on more than one battlefield. After all, the strategy is named after a wrestling hold, so you will have to deal with that. In case you really want to give it a try, I highly advise you to take your time and not rush into anything. Manage your losses and know when to stop so that you do not end up losing your entire bankroll. Even though this strategy seems like a sure bet, keep in mind that playing any casino game implies risks. Remember the famous mystery man branded Hammerlock? — even he never risked more than a $500 bankroll. As for him, I advise you not to rely blindly on the story based on his alleged winnings. As entertaining as it may be, it could be just an urban legend. However, I do not want to discourage you from trying out this strategy if that is what you want. After all, you can consider it a new and fun take on the game you already enjoy playing.